Welcome to The Spirituality Post! A news-magazine about what’s good in the world! A news-magazine about what’s good in the world! I sat back and said, “Thank you!” to all of my friends on Facebook for supporting me in my new endeavor. I was so pleased to see that what I was striving for was actually reaching someone who needed to hear good news for a change. With over 1000 channels of people fighting, one-upping each other and being as greedy as they can, I had decided last year to promote The Spirituality Guidance Channel as much as I could. People were coming there and making use of the resources, videos and spiritual information; but it wasn’t growing as fast as I had thought it would. How could I get more people to come to the SGC? What could I do to present an online news-magazine format that would drive more traffic to the SGC website that was providing very valuable information? I needed a format that would be more accessible and easier to understand for potential readers. However, I wasn’t quite sure how to do it. “I would like to thank all of you for being my friend and reading my threads and posts for the past 8 years here on Facebook. It has been my pleasure to serve all of you with my insights from life and meditation. This year I re-launched the Spirituality Guidance Channel to provide videos, music, art and books to those who are seeking spiritual answers. The response has been good, however it is a great deal of work to maintain and grow this website. 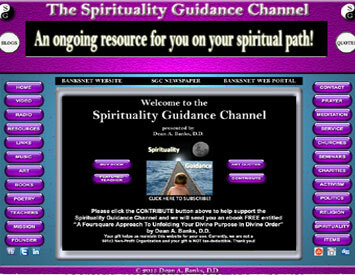 My idea was to offer a thorough and concise website to assist anyone in researching spiritual questions. In fact, one night I was up so late working on the website that when I went to bed, I couldn’t sleep. I got up and tried vegging in front of the TV to fall asleep. Eventually I did, and woke up the next morning with an idea that I could not let go. I had been hearing Arianna Huffington talking in my twilight sleep. I began to wonder about just how the Huffington post started. “The Huffington Post" was launched on May 10, 2005, as a liberal/left commentary outlet and alternative to news aggregators such as the Drudge Report. On February 7, 2011, AOL acquired the mass market Huffington Post for US $315 million, making Arianna Huffington editor-in-chief of The Huffington Post Media Group. In 2012, The Huffington Post became the first commercially run United States digital media enterprise to win a Pulitzer Prize [Wikipedia.com]. Since their commercial success, many offshoots and copies of their style have been created and marketed. Offshoots of this highly successful online news-magazine have enjoyed growth and success due to the brand and model that the Huffington Post has established. The Pussington Post is one of these types of websites. In my twilight sleep I began to wonder, why not The Spirituality Post? A website where people who are interested in spirituality could go and read good writers who are offering their guidance to others. As I mulled over the idea I began to do my research and bought the name. I vigorously began collecting articles and speaking to the writers of these articles; mostly those on Facebook. I have finally finished the website and plan to update it weekly ate first and then daily as it grows and expands. If you have any books, articles, poems or videos that you want to promote, please contact me at thespiritualitypost@gmail.com. Send your written works in Word or Acrobat format. Send your audios in mp3 format (or the link) and your videos in mp4 format (or the link). Please give me some time to sort through your submissions and I will let you know if they fit the format of The Spirituality Post’s guidelines; which I am currently writing. This website is for all of us to have a marketable outlet outside of Facebook that could have an entire life of its own. As a result of this new endeavor, I will be posting most of my writings there and will provide links on Facebook to those articles and quotes. Please join us in the launch of this new website by contributing your talents, making donations or subscribing. The subscription will be free to everyone. Liz and I are writers, musicians and songwriters. This is what we do and we are at a stage in our lives where all we want to do is share our talents, skills and abilities with all of you. As many of you know, any type of business startup is quite an endeavor to undertake. Researching writers, books and videos is very time consuming. I have doing both websites as a labor of love. However, as most of you well know, love doesn’t always pay all of the bills. The time that I spend on these websites means that I have to cut back elsewhere. What am I saying? I am saying that I need help from any of you who are in the position to help financially. Contributions can be made on either website with a credit card or PayPal account. What will you get for your contribution? A daily inspirational online news-magazine that is there for you when you need good advice, a friend to listen and advisors who care. You can go to links that will give you the tools you need to help yourself. You are worth it and that’s why The Spirituality Post is worth it too. We are here to serve your spiritual needs and we are privileged and honored to be of service. In fact, if you can contribute at the Bronze level of $20, I would be happy to send you my complete 10 eBook collection as a “thank you” for contributing. The next level is the $50 Silver level. If you could make this contribution, I would be happy to send you the eBook collection AND a paperback copy of my book, “Spiritual Growth: Articles of Expectation." At the Gold level of $100, your contribution would bring you the eBook collection, my book and a half-hour telephone consultation on clearing out what’s blocking you and making the steps to fulfill your individual purpose. At the Platinum level of $500, I would include everything mentioned plus a half-hour online video consultation. Finally, at the Diamond level of $1000, I would include everything mentioned and a copy of my latest book (to be released Fall 2015). Please contribute at whatever level you can and help us create decent positive uplifting programming that we all could benefit from and share with our friends and families. If you cannot contribute financially, please pray for our success and forward this letter to your friends who can contribute. We appreciate your participation in our ongoing success and thank you and your families for supporting our endeavors. 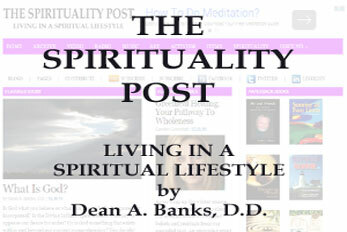 Blogs Blogs authored by Dean A. Banks, D.D. Founder Personal page of Dean A. Banks, D.D. ©2015-2020 The Spirituality Post by Dean A. Banks, D.D.